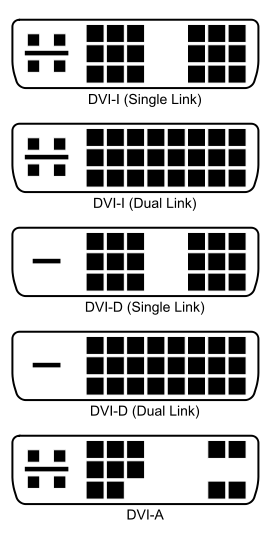 Most of the older computers and many of the new ones come with at least one VGA interface. Older monitors generally had a VGA interface only but newer ones are coming with an HDMI or a DVI interface. Therefore if you want to use your computer with only VGA interface with a monitor with DVI interface then you have only two options. First is to use a VGA to DVI passive adapter. Other options is to use an active VGA to DVI convertor. Since the options available depend mainly on the type of DVI interface being used its necessary to take a look at the various DVI pin configurations below and compare against your own. VGA to DVI passive adapter is the cheapest option to convert VGA interface to a DVI interface. This option however works only if the DVI interface is DVI-I (I stands for integrated) or DVI-A (A stands for Analogue). DVI-I supports both Analogue and Digital signals. 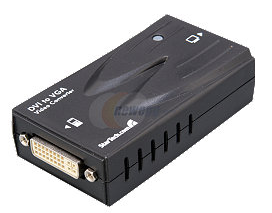 Since VGA is analogue it can be translated between DVI-I and DVI-A without complex signal conversion. This adapter can cost anywhere from five to fifteen dollars. VGA to DVI active adapter option needs to be used when DVI interface being used it DVI-D (D stands for Digital). Since VGA is analogue and DVI-D is purely digital, the conversion requires an expensive Digital to analogue or analogue to digital convertor. This converter can cost anywhere from hundred to two hundred dollars. Therefore in general it is better to buy a new monitor or computer than shell out that much money. Note that Dual link and single link are relevant to digital DVI interface only. They only differ in their data carry rate capacity. Both dual link and single link DVI can be translated into VGA using active adapter.